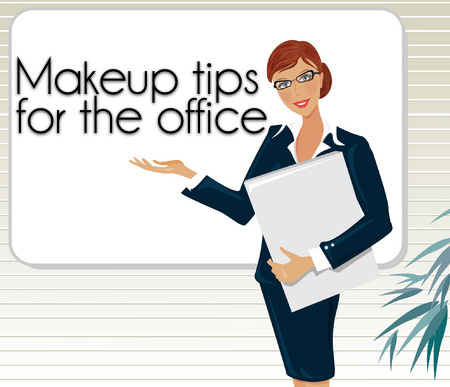 Today Fiona of Jolie Laide Girl shares a few tips to look made up and marvelous at the office. One challenge many young women face is choosing the right makeup for a corporate environment. Looking competent and professional is incredibly important. Although that might mean putting down the glittery eyeliner, it doesn’t have to mean bare-faced beauty. Studies have shown that women who wear make-up to work are more likely to get promoted. The trick is finding a look that enhances your natural beauty. For most people, a striking look isn’t usually the way to go, but please don’t take that to mean that standing out in the workplace is always a bad strategy. Some of the most succesful women I know made an effort to stand out with their appearance, whether that be with bright lips or their choice of dress. However, smoky eyes in the workplace are generally considered a no-no. They either look too sultry or like you didn’t remove last night’s make-up. Either way, it doesn’t spell promote me! It has to stand the test of time; you don’t want to have to keep retouching your look when you have to dash from meeting to meeting. It has to be low-maintenance and easy enough for you to be able to complete in a rush. Some people might be prepared to spend 30 minutes doing their face in the mornings, but I’d rather spend an extra 20 minutes in bed and 10 minutes doing my face. It should enhance, and not hide who you are. It shouldn’t be distracting; remember, you want people to be listening to what you’re saying without being mesmerized by your hot pink lipgloss. It should make you feel both comfortable and amazing. If you’re busy stressing about your eyeliner, how can you hope to concentrate on that spreadsheet?! So, what are some products you can use to look gorgeous at the office? Well, since you want your make-up to stand the test of time, start with a good base. For eyes, there are a number of excellent products: MAC Paint, Urban Decay Priming Potion, and ELF Eye Shadow Primer are just a couple of my picks for eye shadows. For skin, my current favorites are Smashbox and Tarte’s Primers. Foundations and concealers are next on the eye list, and make sure your base isn’t too thick or pasty. I adore dewy skin where it’s appropriate, but it does tend to get shiny, and shiny doesn’t say cool under pressure. Matte is the way to go here. I dust my face with powder to matte down and carry blotting papers for lunchtime touchups. 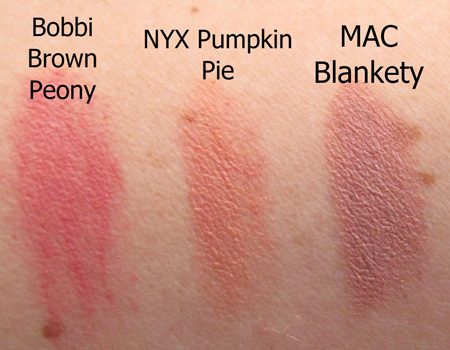 A couple of brands with blotting papers are Sephora, MAC, and Boscia. Eye colors are up next, and I have a couple of work safe looks I rotate. Basically, they’re all about subtlety, rather than showing off your amazing blending skills. I know, I’m sorry — colors that make you look wide awake are great as well. Oh, and I might have hinted at this before, but I’ll say it now: glittery colors are a big no-no. Keep them for the weekends, girlies. I have green eyes, and I love colors like taupes, bronzes, browns, and greys. I have a few standard looks: a light taupe on the lid with a bronze on the crease; a light taupe on the lid with grey on the crease; or an all-over beige with a sweep of brown liquid liner. Highlighting is still important, but keep it subtle! Eyeliner on the outer third of my eye makes me look better, too, but in browns and greys; never black, as it’s too strong. Shadows I come back to again and again: MAC Ricepaper, Satin Taupe, Smoke and Diamonds, Woodwinked, Bronze, Arena, Shroom, Benefit Nice Melons, and ELF’s Mineral Shadow in Natural. Eye liners: Bobbi Brown Gel in Graphite Shimmer, MAC Fluidline in Rich Ground, Urban Decay in Corrupt and Bourbon. Mascara obviously has to happen, and the big thing for me is making sure that it will last a long time. Sometimes, with the AC in the office and from staring at a computer screen, my eyes will get dry, so I’ll rub them. When I do, I don’t want my mascara to give me panda eyes. Covergirl LashBlast is my current office fave, but there are other great mascaras out there. Next, eyebrows are another of the best ways to show off what a professional chica you really are because they frame your face. Keeping them neat and tidy is well worthwhile. Don’t overpluck either, girls. Strong brows are a gorgeous look. 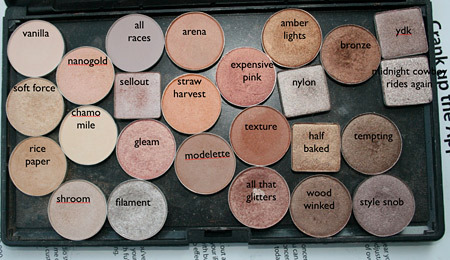 I’ll either fill mine in with powder and use a wax to set, or I’ll use a tinted brow gel like Anastasia. If I’m in a rush, a touch of clear brow gel does the trick. Bonus: it’s completely idiot proof. 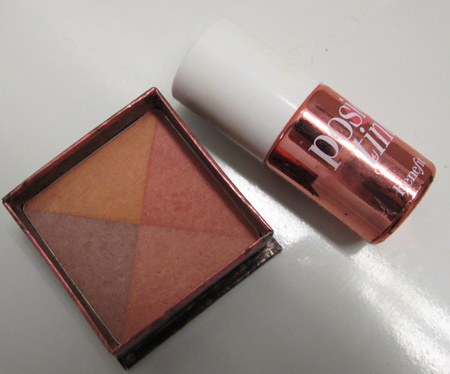 Blush should enhance your lovely face, and while I adore a gorgeous and rosy, just-out-of-the-cold glow, I’m more looking for something to add a touch of color when I’m at work. Be careful about using anything too shimmery, but a touch of shimmer looks nice under fluorescent lights that bounce off your cheekbones. My tip? Use something sheer in which color can be built upon. It helps avoid any early morning blush disasters. 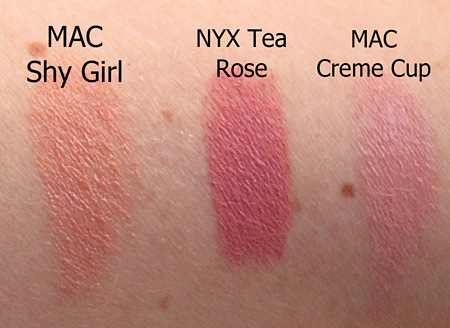 Benefit’s Sugarbomb is hitting my target right now, but MAC Margin and Benefit Posie Tint are great, too. With lip color, you have a little bit more freedom to express yourself than you do at work with eye colors, as long as they aren’t too distracting. Personally, I love pinky nudes and a matte look for Mad Men-style sophistication. NARS Velvet Mattes are my personal favorites for channeling that gorgeous look. Preparation is always important. Most of the time, I’ll prepare my weekday looks on Sunday nights, so I don’t spend time deciding what to wear or rummaging through my drawers looking for a particular color right before work. In my look bag I’ll have 4 shadows, a couple of lipsticks and glosses, a blush, my base, and mascara. That saves me at least another 5 minutes in the mornings (more time in bed!). This post was written by Fiona of Jolie Laide Girl, a British expat living in New York. When she’s not obsessing over MAC, NARS, Benefit and Urban Decay, you’ll find her working in IT for a bank. She shares her home with her lovely husband and their adorable Cavalier King Charles Spaniel, Moose.